Birmingham’s first Chinese councillor will take his seat in the council chamber after winning for the Conservatives. 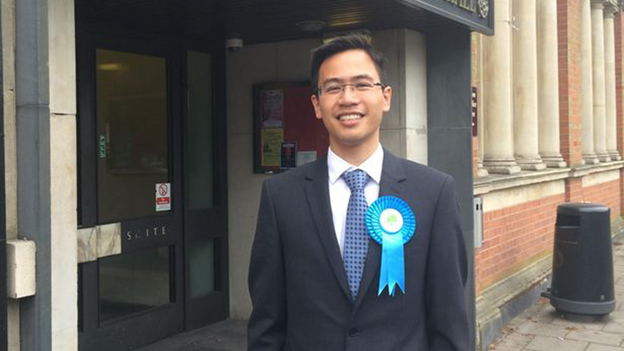 Businessman Alex Yip won the second of two seats up for grabs in the Sutton New Hall ward. The 32-year-old described the result as a breakthrough for the city’s Chinese community. He is vice-chairman of the British Chinese Project - a non partisan group designed to promote members of the community in the political arena. He is also the Birmingham Conservatives’ first ethnic minority councillor and is representing a safe seat for the party. Previously the group has been criticised for being too white and too middle aged to represent a diverse young city like Birmingham. Already they have a crop of younger councillors. “I am very proud to be Birmingham’s first Chinese councillor and part of the Conservative group,” he added. The Sutton New Hall ward is currently at the centre of the battle over green belt development. Coun Yip benefited from a second seat made vacant following the resignation due to ill health of former councillor Guy Roberts. This means that he will face re-election in 12 months time.